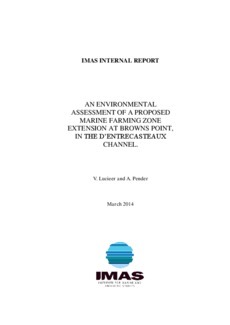 An environmental assessment of a proposed marine farming zone extension at Browns Point, in the D’Entrecasteaux Channel, was conducted in February 2014. The site covered 6 km2 (600.92 ha) and was orientated in a north easterly direction perpendicular to the coastline. The benthic habitats within the zone assessment area comprised of reef (1.5%) and silty sand (98.5%). Environmental data on substrate type, habitat distribution, bathymetry, and benthic flora and fauna were assessed. Within the proposed zone the substrate was characterized by silty sand. On the western boundary three small areas of reef substrate (1.5 % of the total survey area) were identified running out from the shoreline and into the zone assessment area. The bathymetry ranged from 31.2 m to 51.2 m and was characterized by a gradual slope from the shoreline to the east. The silty sand substrate was brown to yellow in colour with shell grit, evidence of active bioturbation; live and dead New Zealand screwshells (Maoriculpus roseus), brittle stars, squat lobsters (Munida haswelli) and polychaete worms were common across the whole site. The video surveys on the western reef showed the presence of Zoanthids (Parazoanthus sp. ), Butterfly perch (Caesioperca lepidoptera), Bullseye (Pempheris multiradiata) and Rosy Wrasse (Pseudolabrus rubicundus). Flora included cup sponges, branched sponges, feather stars (Cenolia tasmaniae) and red algae (Phyllospora comosa).